The Zamorin is dead; Long live the Zamorin! We announce with deep regret the passing away of Mr.P.K.S. 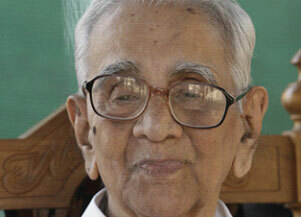 Raja, the Zamorin of Calicut and the patron of Calicut Heritage Forum. He was 101 years old and breathed his last after a brief illness. He had his education in Calicut and Chennai from where he graduated with honours in Mathematics. He worked in the Telecommunications department as an engineer and served all over the country from Guwahati (Assam) to Sukkur (now in Pakistan) to Chittagong (now in Bangladesh). He retired as Deputy General Manager of the department in 1971 and preferred to stay on in Chennai till 2003 when he shifted to Calicut. He was anointed the Zamorin of Calicut on August 17, 2003 and soon won the hearts and minds of the citizens of Calicut with his humility and his cosmopolitan outlook. He represented the composite culture of Calicut where people from all communities lived in peace and prospered. In a touching tribute, the Chief Qazi of Calicut, Imbichammad Haji, termed him an icon of communal harmony of Calicut. ‘He respected and stood for the welfare of Mishkal Mosque, Kuttichira with the same integrity with which he stood for the development and protection of Tali Temple’, he said. He was a great scholar who carried his learning lightly. We recall our meeting with him at his residence a couple of years ago, in the company of Roy Moxham, the British author (http://www.roymoxham.com/) and a great friend of Malabar. The Zamorin narrated to us excitedly of his visit to the room in the Cambridge University where Hardy and Ramanujam had worked together for some years. He also referred to the unsolved equations of Ramanujam, and when Roy mentioned about some recent book which had unravelled the mystery, he was keen to get a copy. His knowledge of history of the world, as well as of Calicut was stupendous. He would recall minute details of the Second World War during which time he was involved in war-time communications. He was certain that Calicut prospered under the Zamorins only because of its open door policy which welcomed every visitor with open arms and never discriminated on grounds of race, religion or caste. Trade was the engine of growth for the port city and anyone who desired to trade and prosper in peace was welcome. It was only when the Portuguese wanted monopoly rights and when they tried to import the crusade spirit by demanding the expulsion of the Arab traders that the water was muddied. We also welcome the successor Zamorin, Mr. Sri Manavikraman Raja (P.K.S. Raja) who being the eldest male member of all the three palaces, will take over as the next Zamorin on the conclusion of the 12-day mourning. The new Zamorin is equally learned and cosmopolitan. He was in the Indian Foreign Service as a middle level officer and retired in 1980 as Third Secretary from the Indian Embassy in the erstwhile Czechoslovakia. We look forward to his patronage and guidance of the Calicut Heritage Forum. I also pray to let his soul rest in peace. Learnt about his demise through "The Hindu" the other day. I was very sad to learn of the passing away of the Zamorin. Some years ago he met with me and my friend C K Ramachandran when I was researching Vasco da Gama’s encounter with his ancestor. He was most helpful. Our conversation moved on to mathematics and he mentioned that for many years he had been interested in Fermat’s last theorem and wondered whether anyone would find a solution in his lifetime. I was able to tell him that someone had just solved this puzzle. When I returned to London I sent him the book on this by Simon Singh. He was delighted and,apart from sending his thanks,wrote an article about it for a Kerala newspaper. I remember him with great affection. We met him a few years ago and spent an hour or so in conversation about all kinds of matters, some about family but mostly about history. A very sharp and humble person, and he left behind a lasting memory of a good man.. Thank you, Premnath, PNS and Maddy for the comments. Roy - Thanks for the details about Fermat's last theorem. You should meet the new Zamorin when you visit Calicut next.Looking forward to your trip.